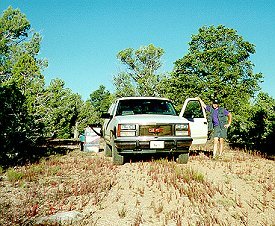 This was a two-week-long, all-expenses paid (by me) trip to Utah and Arizona where I found all sorts of great adventure, high anxiety, brutally hot days, idyllic nights, cold water and sore feet! Of course, some of the above may be figments of my own imagination! July 4th - out of the house by 0715, drive down to Malibu with mountain bike to join Pasadena Mountain Bike Club on some sort of ill-defined Santa Monica Mountains mountain bike ride. Park on PCH next to Gladstone's For Fish, find the rest of the slackers, and proceed up Sunset then Palisades Dr to a fire road and to the top of the Santa Monicas at 2000' in six miles. It's the last mile or two that's the toughest. The next eight or so miles are a bit less grueling, with the most interesting thing of note being Wrongway Frank's chainsuck event. It ends up taking us about 20 minutes to pry the chain out from between the hub and the cluster, pry out a broken spoke, bend another one, and basically munge his rear wheel. "To save it, we had to destroy it..."
So here it is Saturday morning, I've got a hangover, and I'm not gonna begin my vacation today. But I have lots of chores to do before leaving, so Saturday works out perfectly as a get ready for leaving day. Unfortunately, the old "Service Engine Soon" light comes on on the dashboard, further complicating my potential departure. Ok, so somehow I get through the preparations for leaving, the dashboard light bit, and finally, Monday July 7th, I get out of town around 5 pm. Just in time for outbound traffic. I make it all the way up I-15 to the California-Nevada stateline and good ol' Buffalo Bill's casino. 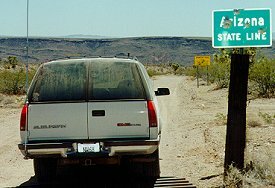 Primm (Stateline), Nevada is one of the weirdest apparitions I've ever seen - short of Divine in a John Waters comedy - here you are, dropping off the 4000'+ Mountain Pass in California, dropping east down a narrow canyon as the highway begins a slow curve to the north. 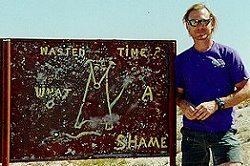 Then, as you come out of the canyon and are beginning to face northeast, and you look out over the vastness of the eastern Mojave Desert and the sheer absence of humankind, you see it. Primm, Nevada. Like a specially-treated petri dish loaded with an agar solution, one half of which is painted with antibiotic, the other half clear. The three casinos, parking lots, roller coasters and elevated trains of Primm, Nevada, end at the state line. Like a laser beam was drawn across and cut off anything hanging over. However, the bacteria is mutating to adapt to the toxic environment. Since California doesn't allow the casinos (that's a wonderful thing, come to think of it), the powers that be have conspired to build a huge 18-hole golf course on the California side of the border, and sell memberships in it. Ok, what's so weird with this? Well, 20 years ago, the first time I remember passing through this wilderness, this was a desert. It was occupied by the Ivanpah playa (easterners call it a dry lake bed), and when the wind blew, the alkali dust from the playa would form clouds hundreds of feet high which would carry on the wind for tens or hundreds of miles. The playa, at an elevation of about 2600', surrounded by the McCullough, New York, Ivanpah, Clark and Spring Mountain ranges and split by the narrow twin pavement of Interstate 15, formed an oddly attractive, geometric yet startlingly lonely vista in a land haunted by wondrous, stark, startlingly lonely vistas. So now there's this massive miniature city a'formed here. Kinda like those "Magic Rocks" aquariums that were around when I was a kid. Grew right out of the floor of this playa. And from somewhere vast quantities of water have been harnessed to power the town and more amazingly the golf course across the state line. As I creep up on the state line, stealthily, quietly (at 80 mph), the city of Primm Nevada continues to exude from the very ground, like a mirage on the playa. What a sight. Well, there's no use fighting it tonight, 'cause there's a great roller coaster here in Primm. The Desperado. $5 gets you a ride on a fairly heinous machine. Over 90 mph! (Maybe faster?) Over a 300' drop! (Maybe more?) The absolute coolest thing is that drop: when the car crests the rise, and all you see is this bitty little hole in the earth into which the coaster is supposed to enter, you get nervous. Irrationally. After all, it must work ok, as there aren't any bloody dismembered body parts and cabezas lying next to the hole. But still, you get scared - just a bit. The drop gets you to the edge of freefall. I finally leave Primm, but without the ride. The lady at the ticket counter seemed terminally occupied with a couple in front of me who had some sort of coupon book, and she must have spent fifteen minutes dealing with this. Meanwhile, the folks in the line shifted and shifted, and didn't seem to mind too much. I on the other hand, had an agenda. So, I leave. As I drive away and reboard the Interstate, with my next destination Las Vegas, the stupid "Service Engine Soon" reappears. It stays on all the way into Las Vegas, off the freeway and into the parking structure of New York New York, rumored by others to have another awe-inspiring roller coaster. One thing's for sure - the (what appears to be) full-scale replica of the Statue of Liberty, complete with fire boats moored at its base, is pretty impressive! Again I am thwarted. My mad dash (well, canter) through the labyrinthine casino, specifically designed to prevent direct access to any point from any other point in the casino, the path optimized to provide maximum income to the casino by drive-by gamblers and random slot machines, comes up with naught. I arrive at the entrance to the roller coaster only to be turned away and told to return on the morrow at 10am. Las Vegas, the 24-hour town - indeed. It is the 8th of July, about 5:30am, I find myself awakening at Callville Marina on Lake Mead. It is humid, about 95°F, and dead calm. I drove here from Las Vegas last night, parked in the mostly-empty lot adjacent to the launching ramps, and fell asleep in the 100°F+ temperature. Now, the sun is soon to rise, so I get up, go to the restroom facilities, and get moving. Up the road further, on the west shore of Lake Mead's Overton Arm (the old drainage of Meadow Valley Wash and the Virgin River), I stop at a natural hot spring and am amused (surprised?) to find the sign (posted by the Lake Mead National Recreational Area folk) pictured here. It sounds so exotic, this amoeba. So terrific. Just like something out of Zaire, Uganda, or Hollywood. (Which are very nearly the same, each just as dangerous, only slightly different.) It also raises all sorts of questions, like "why just the nose and not the mouth? Or eyes? How about open wounds?" Or, "Is this is a virulent biological weapon or what?" After passing through Mesquite, Nevada, and refilling the tank, getting another five gallons of drinking water, and some food, I venture south then southwest along Nevada SR170 and cross the Virgin River as I head south toward Lake Mead again. 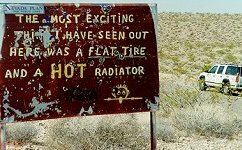 Along the side of the road, about 15 miles out of Mesquite, I happen across a sign with a curious epitath. On on the obverse, another interesting thought. Desert humor. I wonder how long these signs have existed out here. Certainly the material used to fabricate them gives away no secrets concerning the fabrication date, except that it doesn't look recent. The number of bullet pockmarks, a sizable number, betray no age secrets. Finally I arrive at the end of the pavement. Thirty-five miles from the highway, at the end of that many miles of mostly well-paved road, and at the beginning of what will be nearly 150 miles of dirt, sand, gravel and occasionally serious 4WD goat path. I find myself at Whitney Pockets, a dell formed by uptilted sandstones in brilliant salmons, pinks, vermilions, and rusts. My destination for today is Arizona, but not by the short path directly to the southeast at the road forks here. 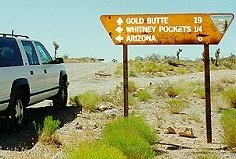 I will continue south for another few miles on Gold Butte Road, mainly to investigate the mysterious "Devil's Throat", seen on my Automobile Club of Southern California Indian Country map, and then head southeast along the Grand Gulch Road (BLM Route 113) into Arizona. As I approach the point on the map that has the designation of "Devil's Throat", I espy up ahead a chainlink fence surrounding an area. As I get closer, I see that the area which the chainlink fence surrounds has gone missing. Imploded. Vanished. In other words, it's a big hole. Devil's Throat is a modern sinkhole, formed supposedly within the past decade or so, and is currently about 125' deep and 75' across. I park a respectful distance away from the hole and angle in for a closer view. It's a big hole. Not quite as big as Dante's Descent, about 300' deep and 80 miles south of here on the Coconino horizon northwest of Ash Fork, Arizona, but impressive nonetheless. Especially if it's formed within the past decade or so! I am told later that there are significant underground rivers in the area, and that these rivers cause sinkholes to occur from time to time. I'll talk more about this later! I leave Devil's Throat and continue southeast now on the same road, bound now for Arizona. Soon I peak over a rise and descend into the great state of Arizona. It's nice to be here, out of the sin and corruption of Nevada... Though, from this particular location, there appears to be little of each in either state. 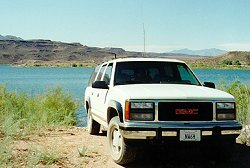 Here I am in the Grand Wash (junction of BLM Rt 111 and Rt 113; 36N20.7 : 114W00.2), headed south to Grand Wash Bay. 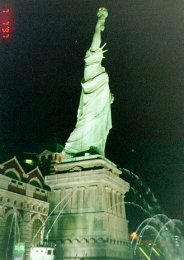 I was here 2 years ago in June 1995. I have returned, as MacArthur once said. I wish to inspect the changes in the wash, take a bath in Lake Mead, and enjoy the beauty and awesomeness of all that water in such a desert universe. And the particularly cool sight of Wheeler Ridge, on the south "shore" of the Lake, poking up out of the water. Grand Wash drains about 900 square miles of the far-western edge of the Arizona Strip. The AZ Strip is a 4400-square-mile piece of Arizona bounded by the Colorado River on the south and east, the Utah border on the north, and the Nevada border on the west. It is a very lonely place. Elevation ranges from 870' at the foot of Grand Wash (Lake Mead) to a summit of 9333' high atop the Kaibab Plateau. There are almost no permanent inhabitants, especially out here at the western edge. I make it a few miles down Grand Wash Road (Rt 113) toward the lake when I come across a black-cowboy-hatted rider atop a big 4-wd Kawasaki ATV, going the other direction. Since it's always a novel thing to meet another human out here, I stop and wait for him to come up. He stops too, we say howdy and I soon discover that he is Bob Baines, foreman of the Tassi (TASS-eye) Ranch, located a few miles upwash near Whiskey Spring. We get along to talking about why he's out here. He came down from Cedar City a few years back looking for work and stuck on here at the Tassi. Owned by Jim Whitmore, the Tassi used to be headquartered on Pigeon Wash at Tassi Spring. 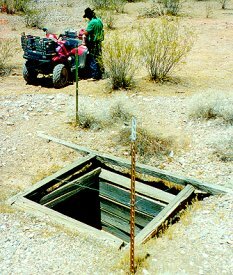 According to Bob, years ago the Feds came along and decided that they wanted to set the boundaries of the Lake Mead National Recreational Area to include the Tassi Spring area, so they evicted the Tassi Ranch from the site and let them set up about 6 miles north at Whiskey. Over the past few years, Bob's spent a lot of time exploring the Grand Wash, mainly keeping an eye on the few cattle that they run out here on this spare land. This also gives him a lot of time to investigate some of the stuff he finds out here, and to work on theories to explain what he's found. And he's definitely come up with an interesting one: how to discover where billions of dollars of Spanish gold is buried. 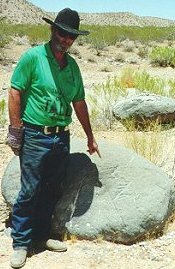 Bob's found some petroglyphs carved into some tuffaceous boulders (guide stones) that are scattered over several miles of the Grand Wash. These marks, he believes, indicate distances in varas (an old Spanish measurement that he says is either about 34 or about 42 inches in length; the dictionary confirms the existence of a vara with length between 31 and 34 inches). These distances are used to determine positions of further waypoints and other locations. The one's he's most interested in are the Spanish Vaults, which locally are also called Mormon Holes. The story has it that these vertical pits, one of which is pictured here, were filled with gold hordes "collected" by the Spanish conquistadors, explorers and padres as they colonized the southwest 400 years ago. Since the gold weighed a lot, sometimes it was best just to bury it out here in the middle of nowhere and carefully survey the position for retrieval later when a better armed force could be summoned. The specific pit shown here is about 45 feet deep at the present, with potentially a vast amount of debris at its bottom. Bob believes that this pit was once 120' deep, dug several hundred years ago by local Indians, and was immediately after its digging filled with gold. From the bottom to the top. That's a lot of gold. The unlined dimensions of the hole appear to be about 8'x8', and with a depth of 120' that makes for about 7500 cubic feet of volume. Gold has a density of about 19 times that of water. Water weighs about 62 lbs/cubic foot. so, there could have been as much as 4400 tons of gold in that there hole. And, at $400/troy oz, that's $42 trillion bucks. OK, so let's assume that it wasn't packed solid with gold. But if even 1% of the volume had contained gold, that's still $400 billion dollars. With that much gold, you'd be comfy indeed. According to Baines, at the time of its digging the pit was unlined. Sometime around the turn of this century, the Vault was discovered by two Mexican brothers passing through the area. They dug out the gold and treasure, and in the process used timber to line the pit as they dug out the goodies. After they recovered all the treasure, they traveled to Los Angeles and got into the textile business and remained very wealthy. I don't have any information on what ever happened to them, though. You'll have to contact Baines to find out more. 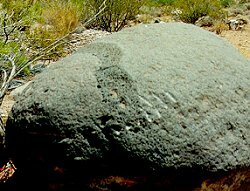 But back to the pit: Bob had found a few other petroglyphs about a mile south of the above guide rock that provided a schematic of the Wash and indications of pathways, the Spanish Vault (Mormon Hole) and even the rock in the picture. An interesting thing: the map was correct only when viewed as a mirror image. He also believes that the Spaniards used triangulation extensively, and that all locations were found as the result of using three other points to locate it. Now some of this I'm sure I'm not getting quite right, but I didn't write it all down. 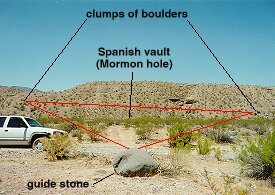 In the case of this guide rock, the other two points used to find the vault were two clumps of boulders on the west rampart of the wash, as shown in the above image. The Spanish Vault was at the center of this triangle, and indeed that's where it is. Baines also talked of the fabled underground rivers edged with black sand beaches, a favorite tale of the desert crowd. 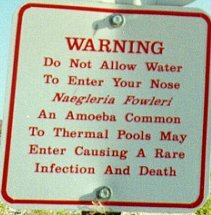 I've known of one of these stories for years, that of the underground river deep beneath Kokoweef Mountain in California's eastern Mojave. Three thousand feet below the local surface at Kokoweef, a 5400' peak in the Ivanpah Mountains, there is this fabled river. Kokoweef is immediately south of Mountain Pass, California, the village on Interstate 15 before the Nevada border, and accessible via the Zinc Mine Rd. The land including Kokoweef itself is private, with some kind of on-again-off-again mining operation there. Recently and in the past, I'd seen rough, hand-painted signs alongside the freeway that read "Kokoweef" and mentioned tours and such, but I also remember times that I'd actually driven the few miles south of the interstate and found decidedly less-friendly signs warning of trespassing and shooting. 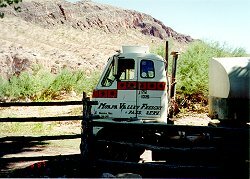 A long time ago, a couple of us had actually motored through the encampment, went by the famous Carbonate King Mine, and found seemingly abandoned trailers, broken-down cars, trucks, busses, derelict machinery and many very unfriendly signs. Needless to say, we'd never gone back. There are underground rivers in this part of the country. Specifically, Thunder River is an obvious and spectacular entry. Flowing out of the massive Redwall limestone, Thunder Spring cascades down a slope and quickly becomes the world's shortest river as it flows the half-mile or so into Tapeats Creek, which then empties into the Colorado River just northwest of the Powell Plateau in the Grand Canyon. On a smaller scale, a huge flow tumbles out as Cheyava Falls about two miles northwest of Cape Royal. Vasey's Paradise in the Marble Canyon is another example of underground flow. But none of these appear to flow from a underground channel that is a single tunnel, but rather from a myriad of cracks and crevices in the solution-cavity-ridden Redwall. The myth exists outside of the denizens of the Mojave too. In the movie Broken Arrow, starring John Travolta, Christian Slater and released in 1996, a stolen nuclear bomb is detonated deep in a mine in the plateau country of southern Utah or northern Arizona and the escape route from the blast is via a natural underground sluice/stream that empties out underneath the surface of a major (most likely Colorado) river. That the mouth of the underground river is hidden from view underneath the mighty Colorado is an obvious way of disguising the mouth of such an underground river. But are there really massive rivers flowing thousands of feet below the surface? Are there beaches of black sand filled with gold lining those rivers? Is there really Spanish gold buried out here, enough to make someone nearly as wealthy as Bill Gates? Is he right? I don't know. Bob's got some interesting theories, and a bit of knowledge to back them up. I guess that only time will tell! Once the sun had moved into the western sky, I had to say adios to Bob, extracting a mailing address from him just in case I ran into new information that could help him in his quest. He turned me on to the old Tassi Ranchhouse, accessible only via the eight-mile Tassi Bar Road (Rt 113) that wound up a long gulley, over a ridge, then down into Pigeon Wash. 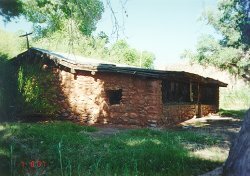 Right where the road crosses the Pigeon Wash, the old ranchhouse is still in fine condition, with a flowing stream of cool, clear and tasty water. The ranchhouse is a cool respite in the heat of this day. It is dark and humid, and the roof is in decent shape, the walls are still doing ok, and the screened-in porch is still mostly screened-in. Could use some work, though, as there are a lot of indolent flies inside the place. But all in all, it'd be a great place to set up camp and hang out for a few days. There are many cottonwoods surrounding the property, and this is evidently one of the problems here. Baines had said that the cottonwoods are very mature, overgrown and desperately need trimming. Occasionally, the heavy limbs on the tree snap off during windstorms or just for no particular reasons, so that it's kind of a dangerous place to live. There's also an old, working watertanker standing at the ready. Baines comes down here every once in a while, fills up the tanker, and uses it to haul Tassi Spring water out to stock tanks at the far reaches of the range. Leaving the Tassi, I continued down the Tassi Bar Rd toward Lake Mead and the Grand Wash arm. Soon, I was at the water's edge, alone as far as I could see, on a spit of land that was fringed with tamarisk. 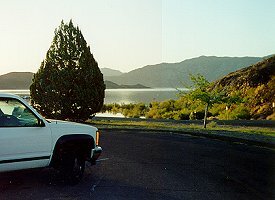 A rough launching "ramp" allowed the truck to get within 15' of the water's edge and allowed me the pleasure of a bath in the blue, warm waters of Lake Mead. The combination of the hot sun, the arid breeze, and the utter isolation allowed me the pleasure of the skinny dip in the lake, but quickly I realized that I was indeed not alone. There were predators afoot! Specifically of the piscatorial variety. Yep, the fish were biting, and I was the bait! After my well-deserved bath, I returned along the path back by the old Tassi ranchhouse, eventually dropping back into the Grand Wash and headed back north. It was mid-afternoon now, maybe three pm, and I wanted to make it up onto the Shivwits Plateau before the end of the day. To do this, I'd need to navigate the rough dirt roads that climbed the Grand Wash Cliffs, a several-thousand-foot barrier raised by vertical movement along the Hurricane Fault. Two years before, I'd done this by taking Pakoon Spring Road (Rt 111) northeast up to the Nutter Twists Road (Rt 1003) junction at Allen Well, thence along Nutter Twists through Hidden Canyon. Two years before, I'd gotten lost in Hidden Canyon, probably wandering south through Rattlesnake Canyon (Rt 1054). I ended up well south of the intended path and seemed hopelessly stuck in brambles that scratched the heck out of the paint on the truck. Only through the use of my GPS receiver was I able to salvage the mistake and pop out on the Shivwits by continuing south and locating Rt 1054, but it took most of the day to do so. So, given that I'd been there, done that, I wanted to find another route up through the Grand Wash Cliffs. The opportunities that presented themselves were several: besides Hidden Canyon, there was Jump, Hobble and Road Canyons to the north, and Grand Gulch Canyon and the Savannic Mine Road up through Pigeon Canyon to the south. Baines had indicated that the Savannic Mine route was incredibly difficult, and suitable only for a ATV or motorcycle, and maybe a jeep. He'd also said something about Grand Gulch Canyon, probably something to the same effect. Jump, Hobble and Road were well to the north, and from the map looked decidedly less difficult and more achievable in the Suburban. But, I wanted to go south down into the Grand Canyon. At the intersection of Rt 1003 (Hidden Canyon Road?) and Rt 1050 heading off to Tank Canyon / Grand Gulch Canyon, I chose to give it a looksee and headed east on the more-or-less passable path. Up ahead lay the escarpment of the Grand Wash Cliffs. An obvious, prominent and impressive step, with further steps looming behind, the line of the cliff was mostly devoid of notches or other declivities that might presage a route up to the next level. As I neared the cliffs, I saw that the road seemed aimed at one minor notch that grew in significance as I motored forward along Rt 1050. The minor notch gradually grew into a precipitous crevice, terribly narrow, without any signs that a road could lay within. But by 5 pm, I was at the foot of the Grand Gulch Canyon, and on a trail more suitable for goats and 4-wheeled ATVs. This was starting to look a little spooky. When last we left our hero, he was struggling up the Grand Gulch Canyon in a vehicle clearly too large for the precipitous, narrow, boulder-strewn defile. Now nearing 6pm, the sun was still well above the global horizon yet no longer illuminated the canyon floor, except on the occasions where the canyon was oriented properly. However, there was plenty of ruddy, reflected light cascading off the high eastern and northern walls that served to illuminate the treacherous path ahead. Grand Gulch Canyon is a slender notch in the Grand Wash Cliffs. The Grand Wash Cliffs are the leading edge of the massive Colorado Plateau, an expanse of northern Arizona, southern and central Utah, Western Colorado, and northwestern New Mexico that underwent an uplift of at least a mile. All this happened about 5 million years ago, when the Pacific Plate got shoved too quickly underneath the North American plate, and forced what were once lowlands and tidal flats to become the Colorado Plateaus. Incidentally, this event also was the basis for the Rocky Mountains orogeny. Zion, Bryce, Grand Canyon, Canyonlands, Capitol Reef, Painted Desert, Mesa Verde and Arches National Parks all owe their existence to this uplift. Rising more than 1300' in perhaps two miles, the jeep trail is the wash bed within Grand Gulch Canyon. Boulders the size of refrigerators, washer-dryer combinations, even Volkswagens, are perched everywhere and also make up the bed of the wash. In the gaps between boulders, there are cobbles, sand and often sagebrush and other vegetal matter. The turning radius of many corners is restricted by large rocks to either side of the trail, generally threatening either the body or undercarriage of the truck. In addition, the vertical climb is not a smooth one: these boulders, carried down-canyon in countless floods over the eons, don't plate out into a smooth pavement. But there are distances where the streambed path is gradual, manageable, and merely an annoyance. It is the dryfalls that make passage difficult. Actually either resistant lenses or layers in the strata that make up the earth here, the erosive action of the cascading cobbles, boulders, sand and water are less able to wear through the streambed rock here, so there forms a small but challenging lip. There are several of these in this canyon, and all are passable, but are truly sphincter-tightening. When I happen upon one of the pouroffs, my standard protocol is to get out of the vehicle (never turn off the engine, you never know if it'll start again), hike upcanyon until the path becomes less stomach-wrenching, watching for pointy outcrops, potential high-centers, perilously-large boulders that could stop the forward motion of the truck. Once I have scouted a path, remembering the important waypoints, I hike down to the truck, set it in gear (currently four-wheel low range), and proceed ever so slowly up the predetermined path. In this canyon, I will elect to do this four times. Why do I do this to myself and my truck? My truck is my friend, my horse, my partner out here in the midst of the unknown. Why do I put myself through this? My innards jostled all over the place, my hands, arms, neck and shoulders aching from hanging on to the wheel, my head tired from watching out for all the hazards, the inside of the truck and my respiratory system coated with the everpresent fine orange dust of the Colorado Plateau. Certainly there is the excitement of discovery, the adventure of getting somewhere that I'd never been before, and realizing that I'd done it all by my lonesome. Hmm. Maybe that's enough. Fortunately, this time of the year the sun doesn't set until just about 8pm local time, so this allows me a bit of margin for situations like this. At worst, there's always the possibility of camping in the canyon. However, there's little or no room to pull aside, just in case the impossible happens and someone actually is wanting to use the canyon route at the same time! The other concern with wash camping is the obvious: they don't call it a wash for nothing. 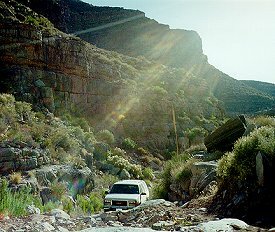 With boulders of greater mass and density than my truck littered all over the place, it's apparent that being stuck in the canyon when there's water rushing down it could be very dangerous. Fortunately for me, the monsoon season is still weeks away and the sky has been devoid of clouds, the air bespeaks the lack of moisture with its low humidity. I reach yet another ragged pouroff in my quest for elevation. Again, I'm out of the truck, reconnoitering. It's now 6:10pm, and this cascade is a climb of about 12', complete with a cattle fence meeting either side of the path at the middle of the jump. There's no gate as the fear factor alone for any cow attempting to walk down the road would probably be sufficient to keep them on their side of the fence, whichever side that is. Beyond the pouroff, the path continues to climb, somewhat less steeply, but winding up a streambed that is absolutely choked with everything from teacup sized cobbles to Kelvinator-sized boulders. There is an obvious route though this warzone, but only in a general sense. The nastiness quotient of this section is high, indeed. I hike about 1500' upcanyon and gain probably 200' in the process. Soon after the waterfall and a few hundred feet of more-or-less straight path aiming due east, the road takes a headlong turn north and climbs up out of the very bottom of the wash, finding a minor purchase on the east shore of the wash. Here, the path smoothes out a bit and the quality of the road increases immeasurably. Having walked far enough to realize that this section of rough road is only about 500', I return to the truck and gird myself for the ordeal. The pouroff is easier than I thought. Creeping at less than one wheel revolution a second, I avoid bottoming out the nose on the highly-angled approach, and indeed am even able to keep the rear afloat through careful choice of route. Another 450' and I'll be clear of this heinous section. Ahead, the pavement appears constructed from interlocked, mildly rounded boulders, with the occasional scrubbrush having gained a foothold between the rocks. So carefully, I rock from rock to rock, first one tire, then the next, finding it difficult to maintain a steady, even pressure on the pedal on account of the huge sideways, front/back, and up/down motions of the truck. I am veering right a bit, to allow the truck sufficient turning room around a nasty little outcrop on the left, but at the same time finding that attempting to put the right front wheel of the truck on the chosen boulder is difficult going. I appear to be lifting up some other part of the truck enough that the wheels are losing traction. Damn. Ever so gently, I let the truck back down, off the big rock. In doing so, I slide the sidewall of the rear left across a outjutting stone that has just a bit of an edge on it. Of course, almost as quickly I hear the sound of punctured, bleeding tire. This is a bad development. I rush out of the truck, take a jog around to ascertain which tire has suffered the damage, get out the duct tape and see if I can help reduce the hemmoraging. With quite a lot of tape slathered on, I get back in the truck, put it in gear, and proceed in a very straightforward manner over the immediate obstacle, reach the left-hand bend, then the good path and gain a few hundred more feet before finding a wide, fairly level spot at which tire-changing is possible. Better this than attempting to use a jack in the cobble bed, where the truck is already dangerously tipped. Out comes the jack, a spare, gloves and a few choice words. It is now 6:30pm, the sun is lighting only the higher ramparts of the canyon, and it is still in the high 90s. I have chosen a reasonably level spot to replace this flat, and within a few minutes the chore is done, the ravaged tire is stowed into the rear of the truck, the jack is put away, and I can get moving again. I do a once-around and discover that the right front also has a sidewall cut, but it doesn't appear to have gone too deeply into the cord. However, this tire has been also compromised, and I will have to replace it soon. In another 10 minutes I have finally climbed out of the most difficult portion of Grand Gulch Canyon, and the gully here is rapidly widening and the walls are closer to the road level. I am soon clear of the hurdle posed by Grand Gulch and the nasty Rt 1050. However, I am now topping out on the Grand Gulch Bench, perched halfway between the Grand Wash Cliffs and the Upper Grand Wash Cliffs. The Upper Grand Wash Cliffs are also known as the Hidden Rim, as it's difficult to get here in order to look up at them. The Grand Wash Bench provides an imposing, impressive vista. At an elevation of approximately 4500', the view to the west obscured by the pinyon, the Hidden Rim is layered sandstone and limestone strata, ochres, reds, oranges, greys, beiges, slates. The waning sun, just a dozen degrees above the horizon, further draws out the rich tones of this earth. To the south-southeast, the formidable Mustang Point is a 6200' outlier of the Upper Grand Wash Cliffs, with its apron bedecked in the green and grey pinyon of this mile-high country. It is now well after 7pm, and I am continuing south on Rt 1002, accidentally following the spur for the entrance to the Grand Gulch Mine, then backtracking and heading east around the upland of North Fork Canyon, then south to the junction of Rts 1002 and 1012, just south of the top of the drainage into Pigeon Canyon. There are some low water tanks here at the intersection. Rt 1012 heads to the southwest and leads to the Savannic Mine before working its way down one of Pigeon Canyon's precipitous excuses for a side entrance. I continue east on Rt 1002 following the upper course of Pigeon Wash as it wends its way uphill into the ramparts of the Upper Grand Wash Cliffs, the plateau atop which is called the Shivwits. This portion of Pigeon, while interesting in some spots, is nothing like the challenge of Grand Gulch Canyon. But, the sun has crept so low in the sky that any minor rise blocks it. By the time I am about four miles up from the water tanks, I have lost the sun again, this time probably for the evening. Another four miles fall behind and I emerge like a rabbit upon the surface of the Shivwits at an elevation of nearly 5900'. The sun is now falling beyond the global horizon and it has become twilight. From the junction of Rt 1002 and Rt 103, I drive north on Rt 103 about two miles and find the road bisects a grove of pinyon and juniper. To the west, a dirt track leads into the grove and this path I follow to a clearing where it appears others in the past have camped. It's nearly a quarter after eight when I string up the 80m dipole antenna in an attempt to communicate by amateur radio back to friends in Los Angeles. Static crashes and distant station interference conspire to make communication impossible tonight. I eat lightly, sit out for a while watching the twilight turn to the Milky Way, and then call it a night. Today is July 15th. I awake to the dawn while camped in Hell's Little Half-Acre, just a mile north of the intersection of Utah SR95 and SR 261 in southeast Utah. Situated between the broad plateau of the Cedar Mesa to the south and the Bear's Ears peaks to the north, I have yet to fathom why this area is called Hell's Little Half Acre. For the most part, it seems an absolutely fine place to exist, about 7,000' elevation, pinyon and scrub cedar forest, gorgeous vermilion soil, long views, and very pleasant during midsummer. 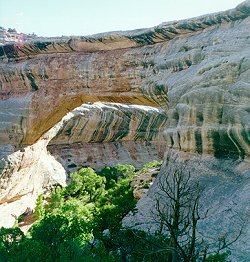 I pack up the truck, brush teeth, wash face, and motor back out to SR95, then west a few miles to SR275 and the entrance to Natural Bridges National Monument. Once in the visitors' center parking lot, I realize that it's just after 7am, and the park won't be open for another hour or so. There are a few others who have arrived here early; they're all foreign tourists (Germans? Brits? Dutch? - they all look alike to me). 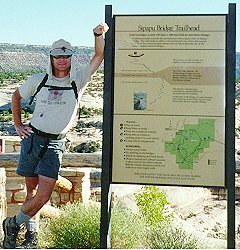 I continue on to the Sipapu Bridge parking area and trailhead, where I change from sandals to boots, get out the day pack, continue to hydrate with plenty of water, and have a little breakfast...Soon, I am Cliff Bar'ed up and ready for a goodly 8.5-mile hike. The hike begins here at the Sipapu Trailhead, goes down to the Sipapu Bridge, thence down White Canyon about 2-1/2 miles to Kachina Bridge. From there, the route forges left up Armstrong Canyon another 2-1/2 miles to Owachomo Bridge. The natural bridges represent three stages: old age, maturity, and youth. Streams no longer erode Owachomo Bridge in its old age, but frost action and seeping moisture do. It may have a fatal crack now - or stand for centuries. Mature, highest and greatest in span, Sipapu Bridge can be hard to spot from the canyon rim overlook, despite its mass. It endures very little stream erosion because its abutments stand very far from the stream. Youthful Kachina Bridge looms huge and bulky. White Canyon floodwaters still work to enlarge its span. 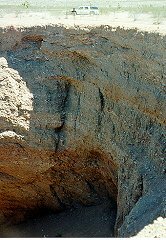 Sipapu Bridge is the northeasternmost bridge and, as you can see from the above chart, midway in size between Owachomo and Kachina. I find it moderately difficult to find a spot where a photograph, even at the widest angle, really can capture the essence of the bridge. The most interesting shot is from dead underneath. I putter around under the bridge for a while, attempting to get a sense of its sheer size. That's one hell of a lot of rock suspended up there. The Park Service doesn't allow climbing on the bridges, but I guess that you'd lack any sense of perspective while on top anyway and certainly couldn't see that you were atop a bridge. Maybe a cherry-picker, a big one. Yeah, that's the ticket. With a cherry-picker, you could sit in the bucket and ease yourself in against the rock, to touch it and get a palpable sensation of the magnitude of this thing. Then you could ease yourself underneath it, following the curve of the rock, and then do the same as you move up to the top surface of the bridge. I finish my reconaisance of the bridge, and sign in at the guest book located on a stand near the underbelly of the bridge. I also take the opportunity to read the comments left by others before me, and to notice that I am the first down here this morning, at least to sign the book. Most of the comments are something like "uuuuh dude! this is totally awesome!" or "thank you my english is no good but i am glad to see the bridge". Most everyone just hikes down to the bridge and then immediately heads back to the waiting automobile and air conditioning, so I feel very much the explorer as I leave these pages of humanity and begin the trek downcanyon toward Kachina Bridge. I always carry the appropriate Michael R. Kelsey book when I am on the Colorado Plateau, and today I have with me his Canyon Hiking Guide to the Colorado Plateau, and his map for Natural Bridges indicates there are pictographs and ruins just downcanyon. I make it all the way to Deer Canyon without finding the pictograph panel. Wandering around for about 30 minutes, looking in all the likely spots, I finally locate the panel on the north wall about 100 yards east of the mouth of Deer. It's a set of what are supposedly called "reverse hand" pictographs, but they look just like plain old handprints to me... The panel's about 8 feet long and contains about 18 - 20 prints.While I didn't touch them, the prints are substantially smaller than my hands. I continue downcanyon until I see a group of ruins in an alcove on the north wall, about 30-40 feet above the canyon bottom. This is Horse Collar Ruins, and it's very impressive. In great condition, most all the walls are still standing, even the roof timbers are still more or less in place. What's nearly as impressive is that there is a sign-in box here with a description of Horse Collar and an explanation that this ruin had been lost and then later discovered, after the national monument was created. Seems that the monument chief didn't notice this ruin, high and obvious on the north wall, for about 20 years after he became the chief. The document claims that he walked the canyon quite often but never seemed to see it. And then one day, some twenty YEARS after becoming the head honcho, on a cold winter day, he was looking for a warm ledge upon which to eat his lunch. He looked up and saw the ledge (but not the ruin!). He climbed up on the ledge and voila! there it was. Pretty lame. I finally get downcanyon enough that I think I should be seeing Kachina. However, it isn't apparent. I step into a large alcove on a bend of the wash; it feels good to get out of the sun for a little while. I, like the erstwhile chief, finally look up and find that I'm standing under the massive Kachina Bridge. It's a big one. After basking in the shade of this huge hunk of airborne rock, I sign in at yet another trail register and next head upstream into Armstrong Canyon, which intersects White Canyon immediately downstream of the bridge. Three miles up Armstrong Canyon lies Owachomo Bridge, the most graceful (and elderly) of them all. After a false start up the bed of the canyon itself and a run-in with a 15' pouroff, I range back downstream until I pick up the trail. It is a quiet peaceful walk upcanyon, sometimes a little difficult to follow the trail, but I don't get lost again. Eventually I actually see a couple walking downcanyon. In passing we all greet one another and then keep moving on. The solitude of the canyon was disturbed by the encounter. About 50 minutes after Kachina, I arrive at the downstream side of Owachomo. A slender, elegant bridge, a flat span supported on two substantial rock pillars. The eastern deep blue sky is framed by the arching monument. I step through the portal and climb up to a point just below the level of the bridge, sit and admire the grace and symmetry of this bridge. And remained amazed that the bridge still stands. It looks so fragile, so incongruous that a span of rock could perform that feat. The remainder of the journey requires a "cross-mesa" hike to return to the car-park at Sipapu. Distance, 2.3 miles. 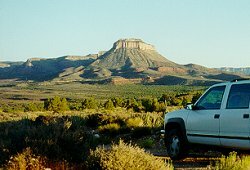 I am treated to some terrific views of the surrounding terrain and of the Bear Ears high over the Cedar Mesa. At 11am, I return to the truck, 8-1/2 miles later, and drink a lot of water. The ranger at Natural Bridges, in response to my questions, tells me that he's heard good reports on the passability of the Black Hole downstream in White Canyon. There's been no recent rain, the potholes and swimming pools should not be too deep, and yes, it is possible for a single hiker to make it down the canyon. Bring a rope, though, to lower and raise packs, and some kind of floatation. Oh, and the water is cold. Most of this I already knew (or at least suspected). Michael Kelsey, in his book, Canyon Hiking Guide to the Colorado Plateau, has a detailed description of the Black Hole and the challenges that await the explorer. Kelsey calls this "one of the best adventures in the hiking world". He and I discuss the book a bit, especially the detail to which Kelsey goes to describe each hike, and especially how much of a maniac die-hard Kelsey must be. I bid him good day and head on out of the Monument. Westbound on SR95 I pull off just below milepost 57 at an open area immediately right of the road. There is another vehicle parked here, from California, with towels rolled up into the windows, and it appears that it has been here only a few hours. I pack up my JanSport day pack, everything in double or triple ziplock bags, especially the camera and film. No need for the GPS receiver, nor a two-way radio. Where I'll be there's no radio coverage. I leave a note on the dash describing where I'll be, and when I expect to return. Into the main compartment of the bag goes two empty 1 gallon water jugs. These will provide buoyancy if and when I come across pools. The temperature now is over 105°F at just 12:30, and depending on exactly when I read the thermometer I can see it go up as far as 110°F. Ahead lies the abyss of lower White Canyon. The path that I follow wends its way across the scrubbrushed mesa and leads to a blocky defile that quickly drops into the depths of the earth. After scaling down some 300', I am at the bottom of a side canyon that quickly opens into the main stream of White Canyon itself. White is over 300' deep here, the sheer walls are a ruddy orange, with buff and white layers and a 15-25' wide sand and gravel floor.